In a medium saucepan, combine rhubarb, 1/3 cup sugar, and orange juice. Bring just to boiling; reduce heat. Cook, uncovered, about 5 minutes or until rhubarb is tender, stirring occasionally; set aside to cool. In a heavy small saucepan, melt white chocolate over very low heat, stirring occasionally. Set aside to cool. In a medium bowl, combine oreo cookie crumbs and butter. Spray pan with non-stick spray then press crumb mixture onto the bottom of a 10-inch springform pan. Add eggs, 1 at a time, beating just until combined after each addition. Gradually beat in melted white chocolate until combined. Pour cooled rhubarb sauce into filling and gently stir to incorporate. Pour the entire mixture into the Oreo crust-lined springform pan. Bake in a 350 degree F oven for 1-1/2 to 2 hours or until the edge of cheesecake is firm and center appears nearly set when lightly shaken. Loosen cheesecake from sides of the pan by carefully running a knife around the edge of the pan. Cool cheesecake for 30 minutes more. Remove sides of pan and cool completely. Cover cheesecake with plastic wrap and chill at least 4 hours before serving. 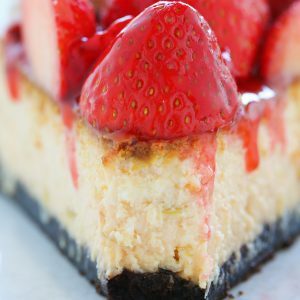 When cheesecake is cool, place strawberries on top with the top side down. Put strawberry jelly into a small bowl and add water. Stir. Brush the watered down jelly over the strawberries. Using a pastry bag fitted with a large french star tip, pipe a border around the cheesecake.